This article was originally posted on FastHorseInc.com you can view it here. Gaga fever takes over a family camp near Onamia, Minn. If you’ve spent time at a youth camp in the past few years, maybe you’re hip to gaga. If you haven’t encountered the gaga phenomenon yet, you’re missing out on the greatest game ever. I was in the clueless category until last weekend, when my family arrived at the Timber Bay campground just north of Onamia, Minn., near Mille Lacs. Each August, we enjoy a long weekend at the camp with a group of other families. We immediately noticed a new feature on the grounds this year — a smallish fenced area in the shape of a hexagon and a rubber playground ball waiting in the middle. The camp director said something about “gaga,” but no one in our group of 50 or so adults and children had heard of or played the game. How quickly that changed. By the end of the weekend, gaga fever had taken over the camp. Gaga, we later learned via smartphone research, is believed to have originated in Israel. The sport spread to Australia and the U.S. and was played largely in Jewish youth camps during the 1970s and 1980s. Within the past few years, the game has exploded in popularity in camps and on playgrounds across the country. Gaga is essentially dodge ball played in a small ring, the gaga pit. If the ball hits you on the knee or below, you’re out. Last person in the ring wins. There are a handful of other rules, but that’s about it. So simple and so awesome. We played the game for hours every day. Kids who were “too tired” to play kick ball anymore made a bee line to the gaga pit. After meals, moms and dads drifted over for a “few games” that turned into two dozen. SO WHAT’S SO GREAT ABOUT GAGA? Easy to learn — It takes about a minute to pick up the rules. Real competition — Adults and kids play together, with no need for the adults to “go easy” on the kids. Seriously, a preteen girl can beat a gung-ho dad giving it everything he’s got (that would be me). Not a “guy thing” — Moms and younger girls hopped into the ring without hesitation, and won plenty of matches. So much action — Games don’t last long, so when you get hit, you’re only out for a few minutes. No hurt feelings — This was probably the most amazing aspect of gaga. I don’t think I saw any kid cry over getting knocked out. Maybe that’s because the game is fun, even as spectator. Or perhaps it’s because everyone knows you get to hop right back in a minute or two. How did you first encounter the game? I first played at a daddy/daughter camp out at a camp in Indiana. I was amazed by how easy the game was to play, how it captured attention of the players and skill or athletic ability didn’t matter. Most important was how much fun it was – we played all weekend. Many people described the game as “addicting.” What a great way to get kids (and adults) exercising, moving and playing together, I thought. What motivated you to become a gaga pit maker? I design and create products for a living. After playing the game and realizing its benefits of exercise, fun and level competition, I was motivated to create a product that would be affordable for anyone, easy to build and durable to last for years. The result was a product that is easy to assemble, portable for either inside or outside use and looks good while being functional. How is Coach Cliff’s doing as a business? Have sales been going well? Who would you say is the typical pit buyer? Coach Cliff’s Gaga Ball Pits is the top choice for building a Gaga Ball Pit. The cost of our bracket systems are affordable, in that you can build it for less cost than making one from scratch. You figure, after adding up the total material cost and your time to build, it’s a value in more than just one way. Plus we have made it easy to build so you can still feel like you are part of the project. Coach Cliff’s products are sold to schools, camps, religious organizations, retreat centers, and many other locations. They are also sold to individual residents for birthday presents, holiday gifts and parties, etc. 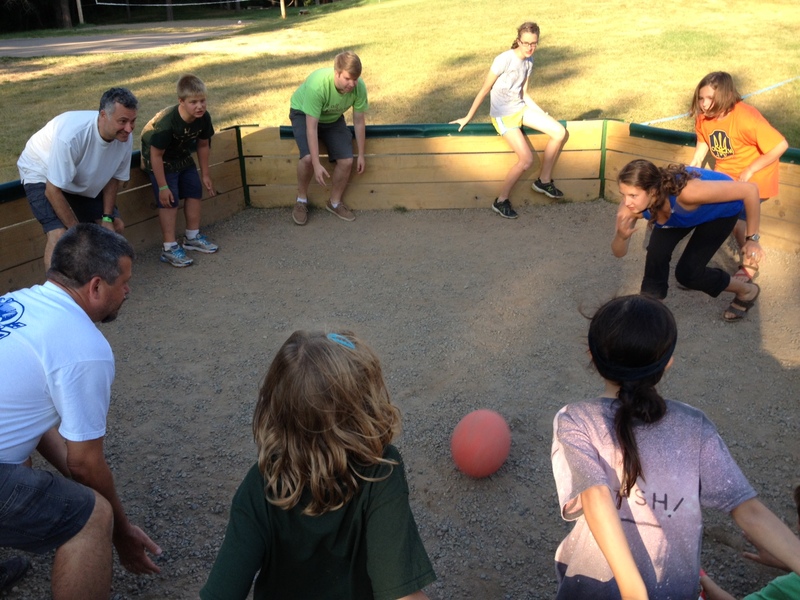 The game of Gaga Ball has its roots from Israel. ‘Ga’ means ‘Hit or Touch’ in Hebrew. It’s called Gaga because the ball bounces two times on the ground to start each game and everyone say’s ‘Ga Ga’ to alert all players that the ball is live. The main object of the game is to hit the ball at the knee or below of other players to eliminate them from the game. The last one in the Gaga Ball Pit after all other players have been eliminated is the winner. For more detailed rules, see Coach Cliff’s Rules. And, finally, what is so great about this game? What makes it so awesome? It’s a great game because anyone, at any age, size or athletic ability can play and have the same chance to win as anybody else in the pit. A player can win a game one minute, and the very next game, that same player might be the first one out. A typical game lasts just about 5 minutes (depending on how many players are in etc.) and keeps people watching the game even when out. Players are getting exercise without even realizing it. Once a game starts, players usually go on for hours playing over and over again. It’s that fun!